Captain Reginald Saxby took over Command of “C” Company from Major E Hall in 1912. 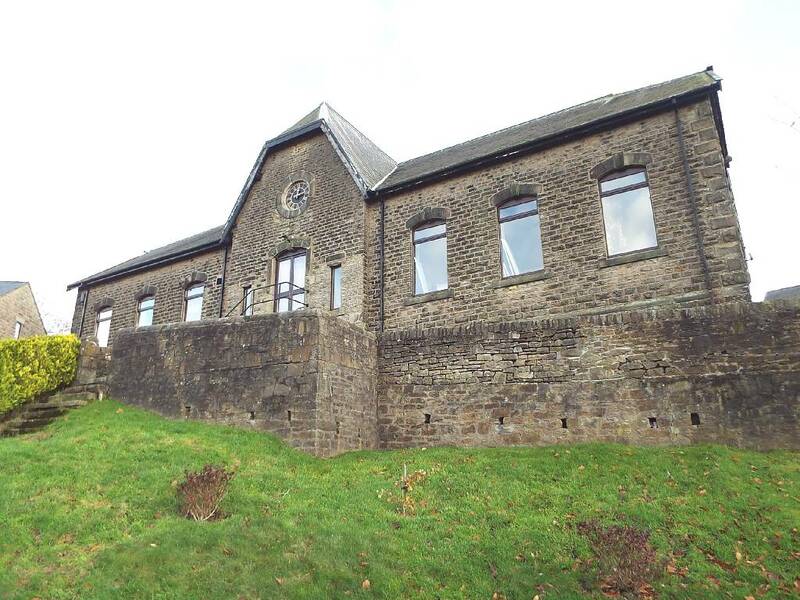 Whaley Bridge Drill Hall on Old Horwich Road built c 1873 for the Band of Hope Temperance Society. “H” Company Officers and Non Commissioned Officers. 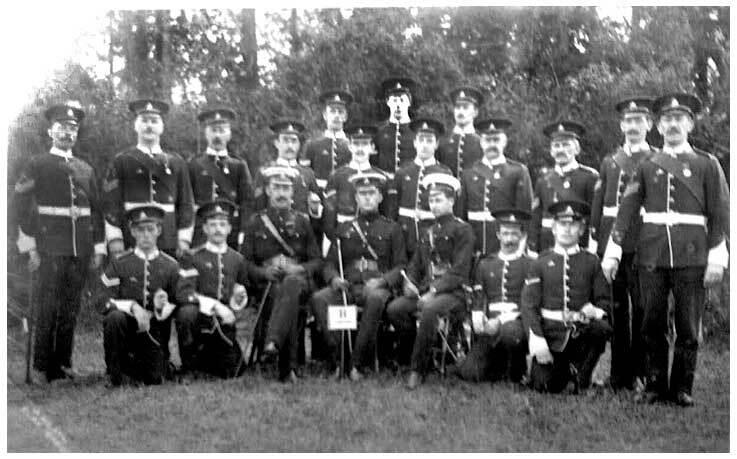 The Officers seated are Edward Hall, Reginald Saxby and Basil Darbyshire (see below). 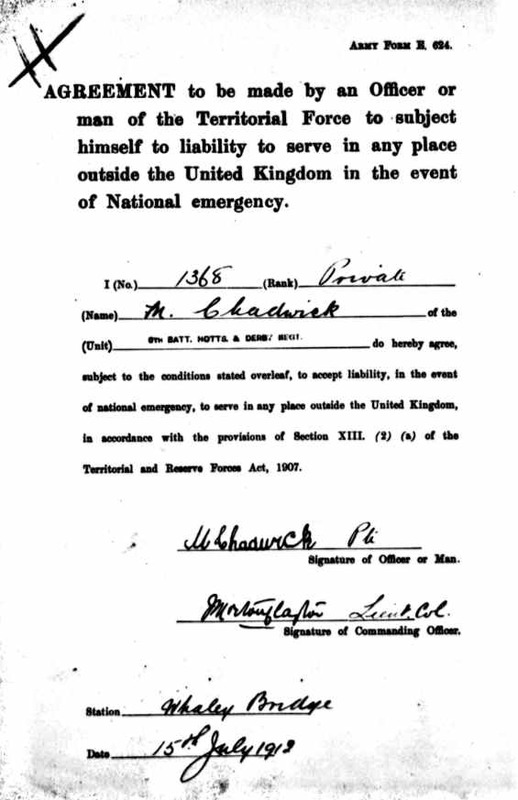 Imperial Service Agreement signed by 1368 Pte Morris Chadwick in Whaley Bridge on the 15th July 1912. 6953 Sergt.-Instr. Ernest Brown. Whaley Bridge. France 25.2.15; Comm 13.12.15. 298 Sergt Edward Burgess. New Mills. France 25.2.15; Disc 14.6.16. 325 Cpl Jesse Ratcliffe. A mechanic from Bugsworth. France 25.2.15; d/w 19.10.17 (22nd NF). 1266 L/Cpl Herbert Smith. A labourer from Whaley Bridge. France 25.2.15; Disemb 3.2.19*. 2155 L/Cpl John William Gould. A joiner from Whaley Bridge. DNSO; Disc 22.2.15 (sickness)*. 1593 Pte James Bennett. A labourer from Bugsworth. France 25.2.15; Disemb 22.7.19*. 1836 Pte Arthur Hector Bennett. From Whaley Bridge. France 25.2.15; 21st Lancers. 1562 Pte Sydney Boothby. A gunpowder labourer from Fernilee. DNSO and Disc 7.2.18*. 1755 Pte Samuel Drabble. A collier from Whaley Bridge. France 25.2.15; Disemb 7.2.19*. 1563 Pte Harry Depledge. 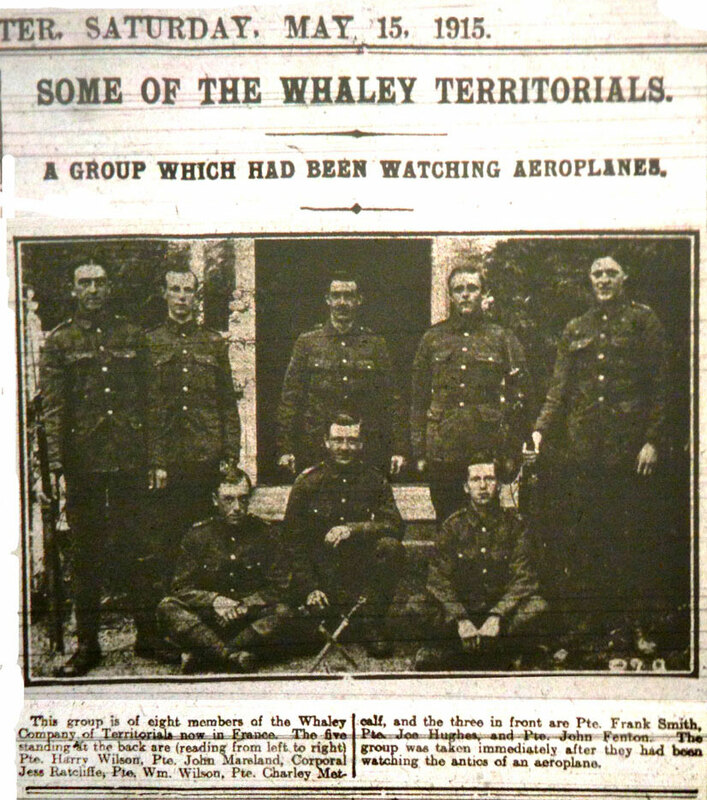 A collier from Whaley Bridge. France 25.2.15; k/a 12.7.15*. 1701 Pte Harry Ellison. From Bugsworth. France 25.2.15; Disc 16.6.19. 1337 Pte Jack Fenton. Bleaching assistant from Bugsworth. France 25.2.15; Disc prior to 1917. 1250 Pte George Hill. Labourer from Whaley Bridge. France 25.2.15; Disemb 11.2.19*. 1339 Pte Samuel Hibbert. Labourer from Whaley Bridge. France 25.2.15; k/a 20.6.15*. 1594 Pte Joseph Hughes. Bleacher from Bugsworth. France 25.2.15; Disemb 24.3.19 *. 2399 Pte Job Hyde. Labourer from Fernilee. DNSO; Disc 31.7.15*. 1754 Pte William Jodrell. Collier from Whaley Bridge. France 25.2.15; k/a 23.4.17*. 1338 Pte Clarence Johnson. Farm labourer from Whaley Bridge. France 25.2.15; Disc 28.2.19*. 1961 Pte John Marsland. Labourer from Kettleshulme. France 25.2.15; Disemb 17.3.19*. 2207 Pte John Peter Middleton. From Furness Vale. France 25.2.15; Disemb 22.7.19. 2052 Pte Walter Murphy. Wine worker from Bugsworth. France 25.2.15; d/w 3.7.16*. 2400 Pte Arthur Pascall. A dyers labourer from Furniss Vale. DNSO; disc 13.3.15*. 2353 Pte Thomas Shirt. A bleachers cropper from Chinley. France 25.2.15; Class z 28.3.19. 1823 Pte Frank Smith. A weaver from Bugsworth. France 25.2.15; Disemb 20.3.19*. 2354 Pte Isaac Thompson. Furnace stoker from Chinley. France 25.2.15; Class z 17.4.19. 1547 Pte Alfred Townsend. From Whaley Bridge. France 25.2.15; Disemb 19.4.19*. 1712 Pte William Wilson. From Bugsworth. France 25.2.15; Disc 21.8.17 (wounds)*. 1797 Pt Harry Wilson. From Bugsworth. France 25.215; Disemb 16.3.19*. 2191 Pte William Yates. From Whaley Bridge. France 25.2.15; Disc 23.3.19. 578 Sergt. Cook James Miller. Labourer from Whaley Bridge. France 25.2.15; Disc 12.5.19. 1265 Sergt Dudley Ward Spicer. Nurseryman from Kettlesulme. France 25.2.15; 51st Bn MGC. 1865 Sergt. Fred Pott. From Whaley Bridge. France 25.2.15. 1866 L/Cpl Thomas Turner. From Whaley Bridge. France 25.2.15; Disemb 20.3.19. 1402 L/Cpl Tom Marshland. Architect from Disley. France 25.2.15; Disc 17.5.16 (TE)*. 1562 L/Cpl William Smith. From Whaley Bridge. France 25.2.15; Comm 30.7.18. 2380 Pte Robert Armitage. Linesman from Whaley Bridge. France 25.2.15; k/a 18.4.15*. 930 Pte Albert Arnfield. Cloth finisher from Birch Vale. France 25.2.15; Disc 19.2.17. 1557 Pte Leonard Bagshaw. Collier from Whaley Bridge. France 25.2.15; d/w 29.9.15*. 1962 Pte Arthur Boothby. Labourer from Kettleshulme. France 25.2.15; k/a 1.7.17*. 1558 Pte Arthur Broadhead. From Kettleshulme. France 25.2.15; Disemb 21.1.19. 1241 Pte William Collier. Plate layer from Whaley Bridge. France 25.2.15; Disc 17.10.17. 1340 Pte Charles Coverley. Labourer from New Mills. France 25.2.15; Disc 27.4.15 (sickness). 2108 Pte Tom Depledge. Collier from Fernilee. France 25.2.15; k/a 29.5.17*. 1559 Pte Fred Garlick. Collier from Kettleshulme. France 25.2.15; Disemb 20.17.19*. 2022 Pte John Thomas Goddard. Labourer from Kettleshulme. France 25.2.15; Disc 14.11.17*. 2189 Pte George Goodard. From Whaley Bridge. France 25.2.15; Disemb 21.2.19. 2382 Pte Charles Hallam. From Whaley Bridge. France 25.2.15. 1539 Pte John Hill. Labourer from Birch Vale. France 25.2.15. 1550 Pte William Hulse. Collier from Whaley Bridge. France 25.2.15; Disc 17.8.16*. 1543 Pte Harry Jodrell. Labourer from Whaley Bridge. France 25.2.15; Disc 9.5.16 (wounds)*. 1710 Pte Arthur Jodrell. Collier from Whaley Bridge. France 18.8.15; Disemb 20.1.19*. 2012 Pte John Frank Jodrell. Engine cleaner Whaley Bridge. France 25.2.15; Disc 29.5.18*. 1551 Pte Herbert Lomas. Collier from Whaley Bridge. France 25.2.15; Disc 14.12.18*. 2190 Walter Edward Lamb. From Whaley Bridge. France 25.2.15; Disc 3.5.16 (wounds). 1354 Pte N Metcalfe. From Bugsworth. No information available. 1779 Pte William Ollerenshaw. Carter from Hartington. France 25.2.15; 139th MGC. 1774 Pte Reginald William Spicer. Gardener from Kettleshulme. France 25.2.15; Disemb 25.8.19*. 28 N.C.O.s and men served with No.3 Section. From these, 26 men served with the 1/6th Battalion in France and 3 were killed in action or died of their wounds. 1 man served with the 2/6th Battalion and was killed in action. Many of the men were wounded or taken sick, sometimes more than once. 1847 Sergt. Arthur Hector King. From Hyde. France 15.8.15; Disc 21.8.16. 1270 Sergt Thomas Jackson. From New Mills. France 25.2.15; Disemb 17.2.19. 2381 Pte George Potter Bagshaw. From Whaley Bridge. France 25.2.15; Class z 14.2.19. 1368 Pte Morris Chadwick. From Salford. France 25.5.15; Disc 3.4.15 (TE)*. 1777 Pte Thomas Arthur Chatterton. From New Mills. France 25.5.15; k/a 12.3.18*. 1822 Pte Jonathan Cooper. From New Mills. France 25.2.15; Disemb 27.3.19*. 332 John Garside. From Mayfield. France 25.2.15; Disemb 4.3.19. 2036 Pte William Gould. From Marple. France 25.2.15; Disemb 26.1.19. 1541 Pte Walter Trevitt Harrison. Colour mixer from Hayfield. France 19.8.15; Disc 23.3.18*. 2356 Pte Frank Hibbert. Cabinet maker from Disley. DNSO; Disc 2.3.15*. 1818 Pte Thomas Jebb. Paper maker from Disley. France 25.2.15; Disemb 19.2.19*. 1544 Pte Henry King. Dyer from Hayfield. France 1916. 1542 Pte John Thomas Kirton. Labourer from Hayfield. France 25.2.15; Disc 3.11.19 (MGC). 2384 Pte William Charles Lowe. From Whaley Bridge. France 18.8.15; 2nd Bn Notts & Derby. 2077 Pte George Miles. Paker stainer from Disley. France 25.2.15; d/w 15.8.18*. 2378 Pte William Henry Mellor. From Whaley Bridge. France 25.2.15; Z Res 17.2.19 (16th Bn). 2081 Pte William Robert Pearson. Callico printer from Disley. France 25.2.15; Disc 19.1.18*. 2082 Pte Wilfred Platt. Fruit works labourer from Disley. France 25.2.15; Disemb 12.3.19. 1826 Pte Eric Oakes. Labourer from New Mills. France 26.2.17; k/a 26.9.17 (2/6th Battn)*. 1369 Pte Fred Scofield. Plumber from Hayfield. France 25.2.15; Disc 3.4.16 (TE)*. 1784 Pte Frank Swann. Shop assistant from New Mills. France 25.2.15; Disemb 20.2.19 (MGC). 1381 Pte Wilfred Taylor. From Glossop. France 25.2.15; Disemb 15.2.19 (Labour Corps). 1382 Pte Alfred Weatherley. Labourer from New Mills. France 25.2.15; Disc 30.3.16 (TE)*. 1763 Pte Fred Weatherley. From Birch Vale. France 25.2.15; Disemb 14.2.19 (Queens RWS). 1829 Pte Oliver Wilson. Mechanic from Hayfield. France 25.2.15; Disc 17.6.16 (sickness). 1824 Pte Fred Wright. Brick maker from New Mills. France 25.5.15; Disemb 24.3.19*. 2083 Pte George Wilkinson. Engine cleaner from Disley. France 25.2.15; k/a 8.4.15*. 299 Pte William James Turner. Cotton worker from Marple. France 28.6.15; Disc 12.5.16*. 284 Sergt Ernest Hallam. Collier from Whaley Bridge France 25.2.15; Disemb 27.1.19*. 773 L/Sergt Percy Green. Calico from New Mills. France 25.2.15; Disc 3.1.18*. 1540 L/Cpl Allen Mason. A labourer from New Mills. DNSO; Disc 22.2.15*. 1537 L/Cpl Archibald Galbraith. From New Mills. France 25.2.15; d/w 4.9.18. 1644 Dvr James Chatterton. Print labourer from New Mills. France 25.2.15; Disemb 17.1.19*. 1773 Pte John Bagshaw. Spinner from New Mills. DNSO; Disc 17.2.15*. 2379 Pte Frederick Bagshaw. From Whaley Bridge. France 25.2.15; Disc 7.1.18. 1776 Pte John Barber. Labourer from New Mills. France 25.2.15; k/a 4.8.15*. 2383 Pte Charles Depledge. Cotton bleacher from Whaley Bridge. France 25.2.15; d/w 5.7.16*. 2074 Pte George Favell. Print labourer from New Mills. France 25.2.15; Disemb 8.3.19*. 1385 John William Hampson. Labourer from Birch Vale. DNSO; Disc 17.12.14*. 1776 Pte Harry Hampson. Dyer from New Mills. France 25.2.15; Disemb 23.3.19*. 1827 Pte George Hammond. Print worker from Birch Vale. France 25.2.15; k/a 16.9.16 (SLI). 1828 Pte Claude Hancock. Labourer from New Mills. France 25.2.15; Disemb 25.3.19*. 1564 Pte Samuel Hyde. Print worker from Birch Vale. France 25.2.15; Disemb. 1380 Pte Harry Jackson. From New Mills. France 25.2.15; Disemb 4.6.19. 2199 Pte William Keogh. From New Mills. No information available. 1565 Pte Squire Liddiard. Labourer fron New Mills. France 25.2.15; d/w 29.6.15*. 1538 Pte Samuel Littleford. Labourer fron New Mills. France 25.2.15; Disemb 24.2.19. 2125 Pte Percy Lomas. Print worker from New Mills. France 25.2.15; Disemb 8.2.19. 1552 Pte Walter Phillips. From New Mills. France 25.2.15; k/a 4.8.17 (17th Battn). 2072 Pte James Thomas Sellers. Print worker from New Mills. DNSO; Disc 9.3.15 (sickness)*. 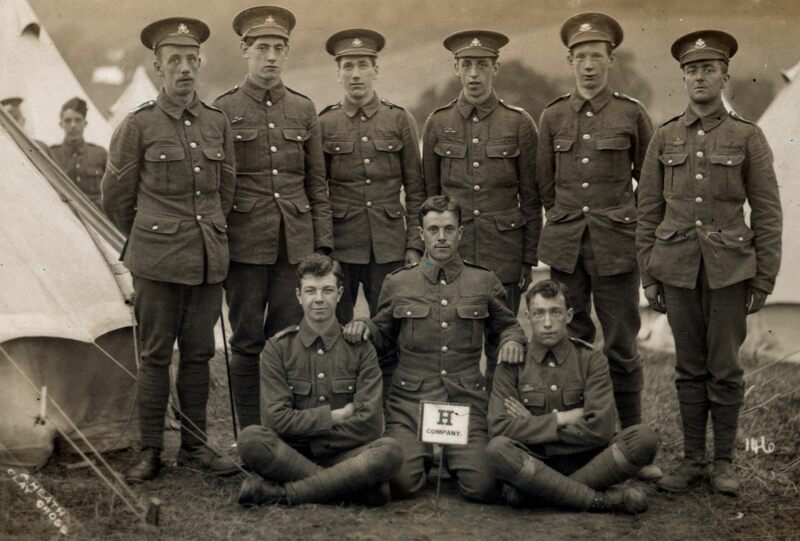 1088 Pte Percy Stafford. Labourer from New Mills. France 25.2.15; Disemb 19.3.19*. 1780 Pte Harry Talbot. Labourer from New Mills. France 25.2.15; Disemb 11.4.19*. 1386 Pte Charles Turner. Labourer from New Mills. France 25.2.15; Disc 11.4.16 (TE)*. 1775 Pte Fred Wright. From New Mills. France 25.2.15; Disemb 3.4.19 (Labour Corps).